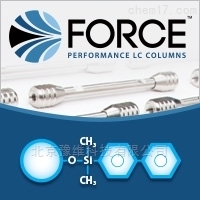 The culmination of 20+ years in LC, Force performance LC columns are long-lasting and reproducible, even under the stress of UHPLC. Premium quality is backed by the strength of our 100% Pure Satisfaction guarantee. And perhaps most important, Force columns are fully scalable between 3 or 5 μm HPLC and 1.8 μm UHPLC, so you can easily transfer and optimize methods without extensive calculations. The innovative Biphenyl is Restek's most popular LC stationary phase because it is particularly adept at separating compounds that are hard to resolve or that elute early on C18 and other phenyl chemistries. As a result, Biphenyl columns are extremely useful for bioanalytical testing applications like drug and metabolite analyses, especially those that require a mass spectrometer (MS). Increasing retention of early-eluting compounds can limit ionization suppression, and the heightened selectivity helps eliminate the need for complex phases that are not well-suited for MS detection. * For maximum lifetime, recommended maximum pressure for 1.8 μm particles is 830 bar/12,000 psi. Enhanced selectivity when used with methanolic phase.